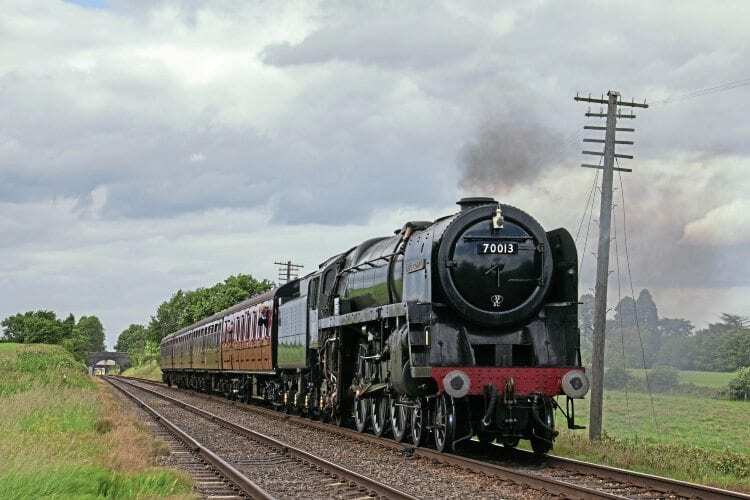 THE much-anticipated return of the National Railway Museum’s ‘Britannia’ Pacific No. 70013 Oliver Cromwell to Network Rail metals draws ever closer following the locomotive’s re-entry to traffic at the Great Central Railway. Custodians the 5305 Locomotive Association recently completed a retube and the fitting of 40 new superheater elements to the Riddles Pacific at Loughborough, and on June 9 No. 70013 successfully passed its steam test. During the following weekend the ‘Brit’ was thoroughly tested as it shared services with fellow ‘Standard’ ‘2MT’ No. 78018, when it was photographed working the 16.15 departure from Loughborough to Leicester North on June 11.